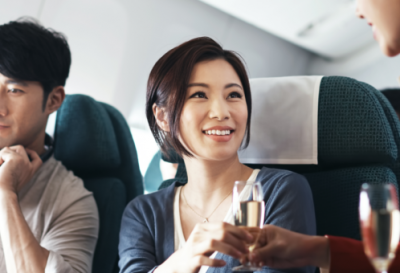 Cathay Pacific are one of the world’s best airlines and an excellent option for oneworld frequent flyers needing to stopover in Hong Kong and North Asia, particularly now that Qantas has moved away from stopovers in these regions. Cathay Pacific is Hong Kong’s national airline. It was founded in 1946 by an American, Roy Farrell and an Australian, Sydney de Kantzow. Both men were ex-air force pilots who had flown ‘the Hump’, a route over the Himalyan mountains, and each man put up HK$1 to register the airline. They named it ‘Cathay’, the ancient name given to China, derived from ‘Khitan’, and ‘Pacific’ because Farrell speculated that they would one day fly across the Pacific (which happened in the 1970s). Cathay made the world’s first non-stop transpolar flight flying over the North Pole in 1998, and the same flight was the maiden flight to arrive at the new Hong Kong International Airport. 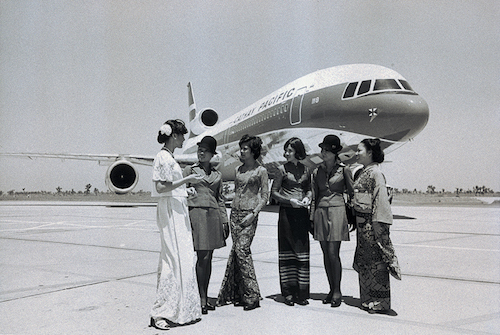 The airline has been awarded Skytrax’s Airline of the Year four times, more than any other airline. Early Cathay Pacific crew and aircraft. Cathay is a founding member of the oneworld alliance. Cathay serves 168 destinations in 42 countries and territories, with a well-developed Asian network. It also serves a number of gateway cities in Europe and North America with easy connections through OneWorld and codeshare partners. The airline also has access to 17 destinations in China through its subsidiary airline Dragonair. The Cathay fleet consists of a variety of Airbus and Boeing aircraft. At the moment there are 41 Airbus A330-300’s in service and 49 Boeing 777-300ER’s. Cathay Pacific ofers First, Business, Premium Economy and Economy cabins. First Class on the Boeing 777-300ER’s have been refreshed and fitted out with First Class Suites. They have a personal closet, an ottoman for stowage or guest seating and adjustable 17-inch tv screens. The leather seat can be converted into an 81-inch fully flat-bed and there is an LCD touchscreen controller that makes it easy to recline your seat, adjust your back support, and turn your lights on and off. Other features include BOSE noise cancelling headphones, a multi-port connector enabling you to stream movies and music from your iPod, iPhone and Ipad to your TV, and a USB port to keep those devices fully charged. There are Ermenegildo Zegna amenity kits for men and Trussardi amenity bags for women with Aesop brand skincare and toiletries provided in the First Class bathrooms. We don’t actively promote Cathay Pacific first class pricing, however, pricing is available upon application. Contact us for more info. First Class on the 747-400’s provides a great deal of privacy with only nine seats in the cabin. Passengers on long-haul flights will receive the Ermenegildo Zegna amenity kits for men and Trussardi amenity bags for women. Your suite is spacious enough to entertain a guest and your seat will convert into a full-length fully-flat bed with duvet, pillows and sleepsuit. There are a 17-inch tv screen with noise-cancelling headphones provided. Privacy screens on the aisle side and between the centre seats ensure added privacy. Cathay’s Business Class seat converts to a fully flat bed 82-inches long and an extension increases its width by 6 inches to provide additional support. 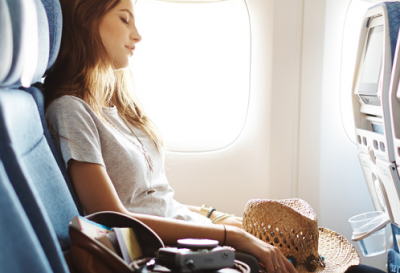 For sleeping, you may choose to leave your armrest up for more privacy, or down for more space. There is also increased storage space with a side cabinet housing your headset and mirror and has rooms for smaller items such as glasses and gadgets. There’s a 15-inch touch screen tv and noise-cancelling headphones provided. As with First Class there is a multi-port connector letting you connect your own iPod and iPhone and stream content to your TV screen, and a USB port to charge your devices. Read our review of flying business class with Cathay Pacific. Cathay introduced a dedicated Premium Economy Class to their aircraft in 2012 with the cabin having 26-34 seats, depending on the aircraft type. Seat pitch is 38 inches (six more than in Economy class) and the seat itself is wider and has a bigger recline. Front-row seats have a leg-rest, and other seats have a 3-position foot-rest. There is also a large meal table, cocktail table, 10-inch personal television, in-seat power outlet, a multi-port connector for personal devices and extra personal stowage space. Passengers receive an amenity kit with dental kit, socks and eyeshade. You’ll also have a dedicated check-in desk, priority boarding at the gate and increased baggage allowance. On long-haul flights there are a few extras with an amenity kit, welcome drink and an enhanced menu selection. Cathay Pacific Economy Class Seating has a six-inch recline (two more than the previous Economy product) are seventeen inches wide and have a 32-inch pitch. More storage has been added with a literature pocket for your books and magazines and amenity storage for smaller items like your mobile phone, pen and glasses. The cup-holder is separate to your tray-table which has a bi-fold design letting you use it as half or full size. The 9-inch tv screen has audio-video on demand and again a multi-port function for streaming movies and tv shows to your personal screen. Meal service is complimentary for all passengers, with two hot meals generally being served on long-haul flights, even in Economy Class and with free alcoholic drinks. 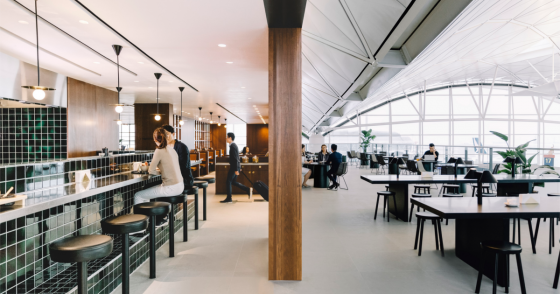 Cathay Pacific has a number of flagship lounges at Hong Kong Airport. The newest lounge, The Deck opened in March 2018and Pier opened in 2017. The lounges have full service bars, baristas, shower suites, and feature Cathay’s iconic Noodle Bar restaurant. Read our review of The Pier business class lounge. Cathay Pacific’s The Deck business class lounge. The Bridge is a premium lounge for First and Business passengers, Marco Polo Club members who are silver tier and above and OneWorld members who are Sapphire and above. It consists of North and South wings, each extending from the central reception area. The North Wing features The Bakery, the Long Bar, a television lounge and general seating area. The South Wing features The Bistro, the Coffee Loft and shower suites. The Cabin features an Ultra-modern design, an IT Zone with high speed Wi-Fi and workstations, The Deli and The Health Bar (a healthy addition to the Long Bar). As with the Bridge lounge, the Cabin is open to First and Business passengers, Marco Polo Club members who are silver tier and above and OneWorld members who are Sapphire and above. Cathay has two frequent flyer programs, Asia Miles, a travel reward program and the Marco Polo Club (or the Club), a loyalty program. The Club is divided into four tiers starting with Green and moving up through Silver and and Gold to Diamond. Members move up by earning Club Miles on eligible fare classes with Cathay Pacific, Dragonair and OneWorld partners. Higher-tiered members are provided with increased travel benefits such as a guaranteed Economy Class seat, additional baggage allowance, priority flight booking and airport lounge access. The Marco Polo Club membership is terminated after 12 months of inactivity or failure to meet minimum travel criteria. Members of Asia Miles can earn miles with the airline as well as other travel partners in car hire, hotel accommodation, etc. Miles are valid for three years from the date of accrual and can be used to redeem travel and other lifestyle rewards.